Pretty much every single time I sit down and reach for the remotes, the same thought goes through my head. 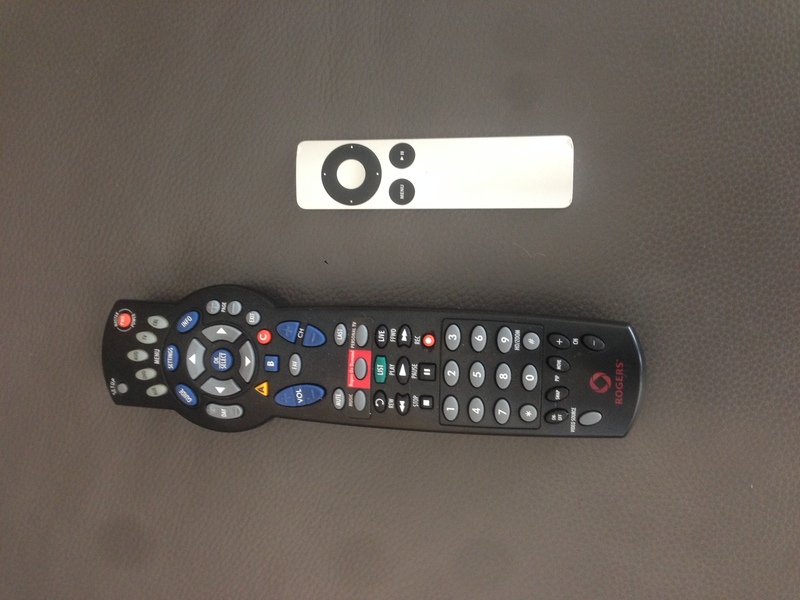 Why is one remote so small and perfect, and one so big, clunky and incredibly complicated? I look at those two remotes and wonder what was going through the heads of the teams who designed these things. One team used the tried and true KISS method (keep it simple stup*d) while the other was intent on putting as many buttons on a remote as humanly possible. “Yes, buttons…lots and lots of buttons of all shapes, colours and sizes. That’s what the consumer wants”. One remote is slick and functional while the other is confusing and ugly. One has just three buttons (all useful) the other has 50 ( I only know what about 6 actually do). It’s funny how my mind turns to real estate when I look at these things. I guess I can’t help myself. Our business is incredibly complicated at the best of times. Wouldn’t it be great if selling real estate was as simple as the three button remote? But really, can it? On any given day, we are explaining any number of real estate terms like BRA’s, FINTRAC and PIPEDA, we are explaining holdover clauses, mortgage verification, and walk scores. We are verifying zoning, SPIS’s and tenancy issues. We are dealing with photographers, stagers and home and termite inspectors. And to top it all off we are trying to show our value to a buyer or seller who simply doesn’t think we earn our commissions anymore. For their part, the consumer doesn’t have it any easier. In fact I would argue that their remote is even bigger. Additionally, they need to weigh which agent and company to use, and who will provide the most bang for the buck. Who’s offering cash back, or offering a free toaster with every sale? Who’s best suited to market my home? Maybe they want no service at all. Then it’s off to explore the myriad of websites and VOWs. It is literally a sea of confusion out there. Instead of trying to make it easier, we keep adding more buttons to the remote. Now we have to be experts in pre-emptive offers, basement apartments and structural issues. Everyday we hear about another RECO complaint and fine handed out so we update our clause books, add more forms, more paperwork, and adapt on the fly to another potential hazard. There is no question that the real estate transaction has gotten more challenging. While we wish the process was as simple as an ergonomically designed three button remote with lovely scrolling thumb dial, we are going to have to get used to the multi-button behemoth we have created. Would not the consumer be better served by a remote that would allow you to select a neighbourhood, scroll down to the right house and then click “buy” and then know that behind the simplicity of the process was the guarantee that they would be in capable and trusting hands? Or is it simply a case that we can’t help ourselves? we need to have more choice? More is better? I’m not sure what the answer is but whatever we do it’s important to keep referring back to the operating manual each time a new button gets added. Be an expert in the real estate business and don’t be afraid to pick up the remote every once in a while either.